As hostess this week, I asked everyone to make a card using purple, yellow and green. 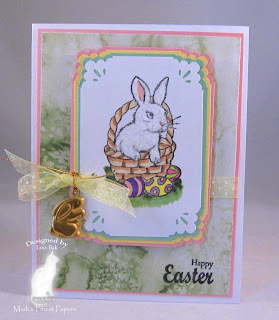 I wanted to make something a little different, so I made an Easter trifold pocket card, using the tutorial in the Resources section of Splitcoaststampers. 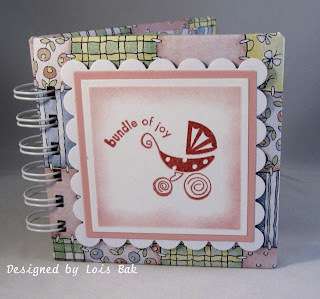 My card base is two-sided designer series paper from Stampin’ Up. I stamped the butterfly from the Spring and Easter 2010 set from Mark’s Finest Papers: Speedy the Cat Collection and sponged on the yellow and purple ink. I also stamped it onto a piece of MFP Naturals Ivory and cut it out using circle nesties, popping on the cut-out butterfly. The band around the pocket card is Basic Grey’s Wisteria DP, matted in Momma’s Favorite Purple. The lily (from the same set as the butterfly) on the insert is colored with Copic markers. 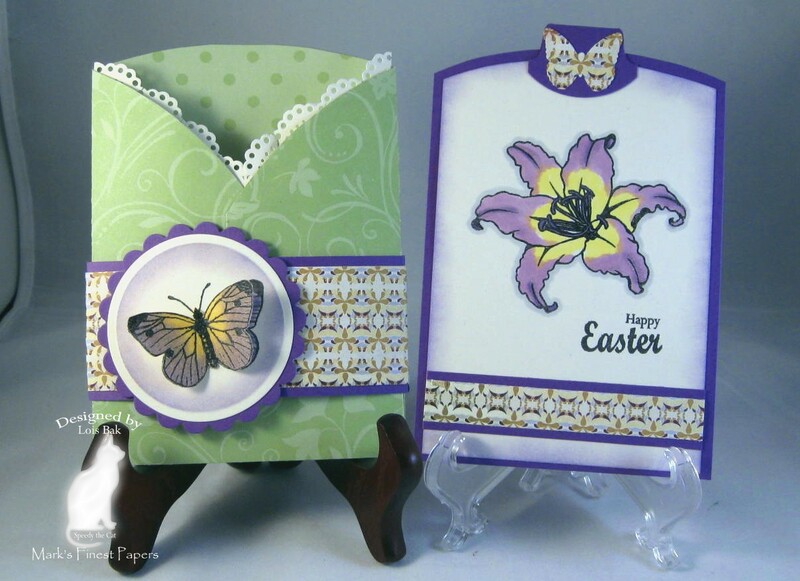 I added a small band across the bottom, a punched-out butterfly on the tab at the top, and the Easter sentiment. 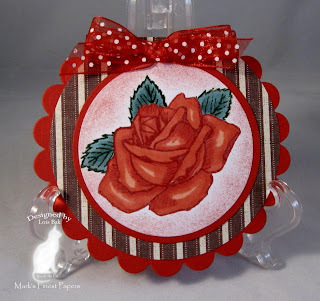 It's Saturday -- time for my favorite challenge on Splitcoaststampers, the Inspiration Challenge. The website for today was Cutest Food, a wonderful site spotlighting the yummiest food concoctions you have ever seen. 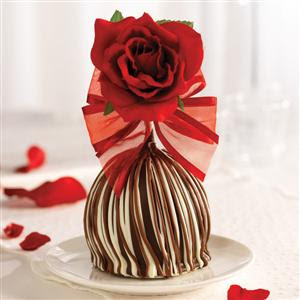 The inspiration for my first card was this beautiful Taffy Apple Rose. I made a round card to emulate the shape of the apple, using some brown and white striped paper I found in my stash as the background. My rose, colored with Copic markers, is from a set called Spring Roses. All materials -- except striped paper -- available at Mark's Finest Papers. There were so many wonderful creations on this website that I was compelled to make a second card. 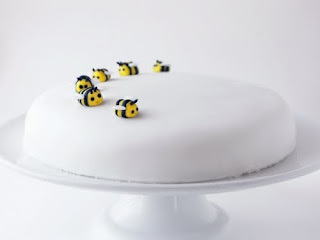 I saw this cute little bee cake and thought it would make a nice simple note card. I used the colors -- white, yellow, and black. Using my Scor-Pal, I scored lines around the edge of the main white panel and then stamped the sentiment from SU's Just Buzzin' By in the upper left-hand corner; and the "Hi There" from SU's Fancy Flexible Phrases at the lower right. I chose the flying bee from Just Buzzin' By,stamped her, then colored her with Copic and Prismacolor markers, highlighting her wings with a glitter pen. NancyRuth was the hostess for the Stampin'B's challenge today. Her monochromatic green challenge came during the right week – St. Patty’s Day was yesterday. I hope the luck of the Irish was with you! I must confess that I used Laura Fredrickson’s (scrapnextras) design for the basis of my card this week. When I saw what she had done with the new Flourishes’ set Irish Blessings, my Irish ancestors channeled me to get this set! Book lover that I am, I like the “book” look of Spellbinders Labels Seven. I cut out the shape using Mark’s Finest Papers Pensacola Sand Naturals and then sponged around the edge with Palette Landscape ink before removing the die. 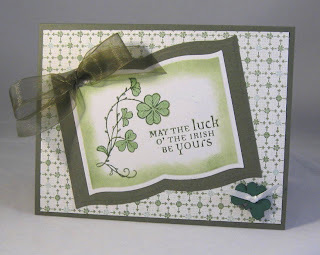 Then I stamped the sentiment and sprig of shamrocks, adding the ribbon and shamrock button. It's a pretty simple card, but it gets the message across. 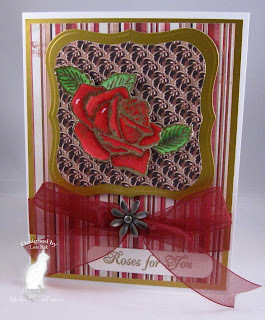 The Flourishes images, cardstock, Spellbinders dies and Palette ink available at Mark's Finest Papers. Today I'm posting something a little different. I thought I would explain my screen name -- Clownmom. For many years I have collected clowns -- big and small, glass and cloth. Here are a few of them. 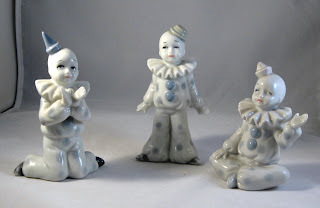 This trio of clowns were made in the look of Lladro -- obviously they are not Lladro, but the muted colors give the same delicate feeling. My late brother-in-law gave them to me. This court jester was also a gift. 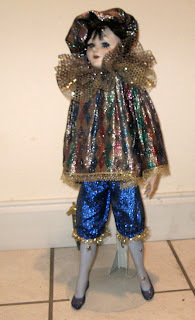 A former girlfriend of my son makes porcelain dolls. She is very talented, as you can see. This beauty stands in my living room. I have worked in the association management business for over 30 years. About 20 years ago, we had a meeting in Sarasota, Florida -- the winter home of Ringling Brothers/Barnam and Bailey circus. 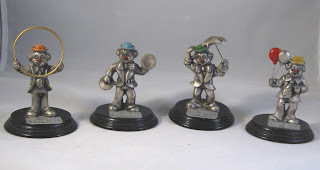 The hotel representative gave each of the attendees one of these pewter clowns as a token. When he found out that I collect clowns, he gave me one of each of the designs. 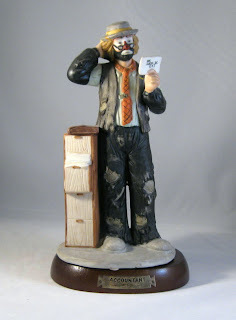 I have several Emmett Kelly figureines. My son gave me this one -- an accountant. As I am a bookkeeper by trade, he thought it was appropriate. My living room has a cathedral ceiling. My late husband put this shelf over the opening into the dining room. It was the perfect place for several of my "sitting" clowns. Finally, the photo in the header of my blog is of a clown riding in the basket of a hot-air balloon -- which hangs in my living room. I'm the only person I know who has a hot-air balloon in her living room. I had always wanted to ride in a hot-air balloon; so for my 50th birthday, that's exactly what my late husband gave me. It was wonderful! Thanks for letting me share another one of my passions with you today. Mark's Finest Papers Design Team is celebrating our BRAND NEW STAMPS for the Speedy the Cat Designer Collection and Serenity Collection with a Blog Hop! For your chance to win BLOG CANDY, visit and comment on each of the design team members' blogs on March 10th, 11th, and 12th. On Saturday, (March 13th), a winner will be chosen from those who have visited all 9 blogs all three days.The winner will be announced on the Mark's Finest Papers Blog and will receive 2 Stamp Sets that will be released NEXT month. And remember, tonight will be the New Flourishes Release at Mark's Finest Papers! I’ve been practicing my watercoloring leading up to today’s card. I stamped and gold-embossed one of the single roses from the Spring Roses set. Using markers and a water brush, I colored it in – adding a couple of highlights with a white gel pen. I cut out and popped up the rose and leaves onto some DP from Basic Grey’s Blush paper pad, which I had cut out using the Nestabilities Labels One die – matted in gold. The wine-colored sheer ribbon and fancy brad added a touch of elegance. Visit the rest of the design team and comment on each blog for a chance to win two new stamp sets. If you haven't commented each day, you still have time to go back and get your chance to win. Good luck! 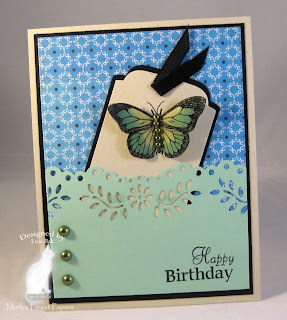 Today my card serves two purposes – Day Three of the Mark’s Finest Papers’ Blog Hop and the Stampin’B’s DT Blog Challenge. 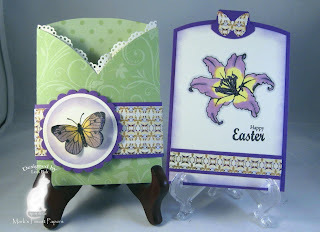 Faith (Markie’s Mom) was the hostess for the Stampin’B’s challenge, and she wanted us to make a Spring or Easter card. Butterflies always remind me of spring – when everything is new and clean. The images for this card are from Daffodil and Anise, a new set from Mark’s Finest Papers: Speedy the Cat Collection – despite the fact that this card has neither Daffodils nor Anise. I do love this little butterfly. I stamped him with Palette Noir Black and quickly clear embossed him. Then I sponged both Landscape and Beaux Arts Blue, adding the green half pearls for his body. The top of the tag was cut using a Spellbinders Labels Four die, and the punched border is a new Martha Stewart border punch. For your chance to win BLOG CANDY, visit and comment on each of the following design team members' blogs on March 10th, 11th, and 12th. On Saturday, (March 13), a winner will be chosen from those who have visited all 9 blogs all three days.The winner will be announced on the Mark's Finest Papers Blog and will receive 2 Stamp Sets that will be released NEXT month. And remember, Friday night will be the New Flourishes Release at Mark's Finest Papers! 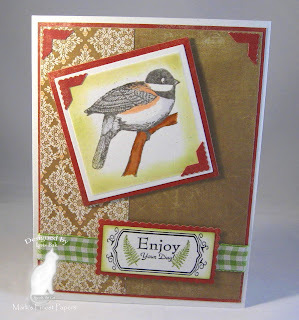 Day Two of the Mark’s Finest Papers Blog Hop features the new set Ferns and Chickadee. I sometimes have a problem doing masculine-type cards, but this set lends itself well to such a card. By using non-floral DP and subtle colors, this would be quite appropriate for a guy. I stamped the Chickadee with Palette Charcoal onto Pensacola Sand, which is part of the Naturals line of Mark’s Finest Papers. Before removing the paper from the square diecut, I sponged some Landscape ink around the edges. The chickadee is colored with Copic and Prismacolor markers. I stamped the smaller ferns and the sentiment in the center of the flourished box and then cut it out using a long rectangle Nestabilities die, sponging around the edges to correspond with the sponging on the bird panel. All the DP is from Basic Grey’s Sugared paper pad. I added some gingham ribbon and the small scalloped photo corners. For your chance to win BLOG CANDY, visit and comment on each of the following design team members' blogs on March 10th, 11th, and 12th. On Saturday, (March 13), a winner will be chosen from those who have visited all 9 blogs all three days. The winner will be announced on the Mark's Finest Papers Blog and will receive 2 Stamp Sets that will be released NEXT month. And remember, Friday night will be the New Flourishes Release at Mark's Finest Papers! Mark's Finest Papers RELEASE Hop and....BLOG CANDY!!! Mark's Finest Papers Design Team is celebrating our BRAND NEW STAMPS for the Speedy the Cat Designer Collection and Serenity Collection with a Blog Hop! They are available TODAY! For your chance to win BLOG CANDY, visit and comment on each of the following design team members' blogs starting tomorrow -- March 10th, 11th, and 12th. On Saturday, (March 13th), a winner will be chosen from those who have visited all 9 blogs all three days. 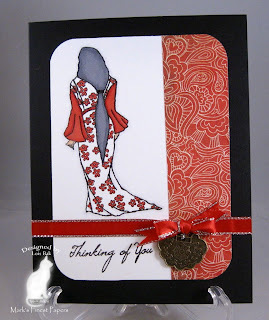 Oriental themes are not usually my go-to images, but I like this Serene Lady from Mark’s Finest Papers: Serenity Collection. I stamped her, using Palette Noir (clear embossed), onto MFP Snow Storm Smooth and colored her with Copic and Prismacolor markers. The red DP strip is from Basic Grey’s Cupcake paper pad. I found this simple layout on Page Maps, a great site for card and scrapbook layouts. I added a strip of ribbon and the Oriental charm for interest. A woman in my office is having a baby girl in April, and we are giving her a baby shower next week. The office staff is giving her a gift card, but I wanted to give her something special. 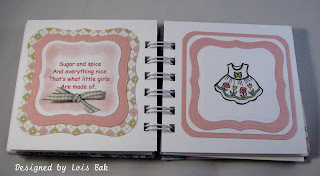 I had made a similar book for my daughter-in-law a couple of years ago. 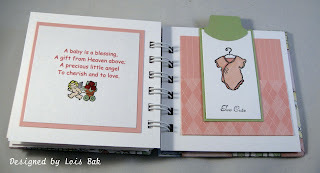 She was having a little boy, so I had to change several things for this book -- mainly the color scheme! I love this quilt-like paper that I used for the cover. I googled "verses for cards" to get many of the quotes I used throughout the book. Unfortunately, the site I had used the first time, Stampers Versalog, seems to have shut down. Fortunately, I had this cute little bit of advice in my computer. Here are four more pages from the book. In total, there are 16 sides with various poems and stamped images -- including one page on which she can insert a photo of her Abby Rose. 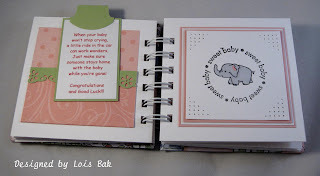 Many of the pages had patterned paper from a wonderful DCWV pad called Nana's Nursery. The page on the left uses paper from that mat stack. Most of the stamps were from a Fiskars clear stamp set, along with several other stamps I had gotten at a garage sale -- the names of which I have no idea. 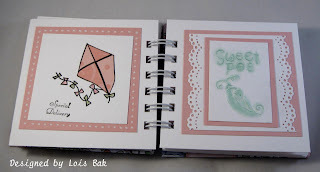 The main colors were Stampin' Up's Pretty in Pink and Certainly Celery. Watercoloring is not my forte; but I figure in order to get better, you have to practice, practice, practice. Joanne wanted us to use a flower as our main image and buttons as our embellishments. 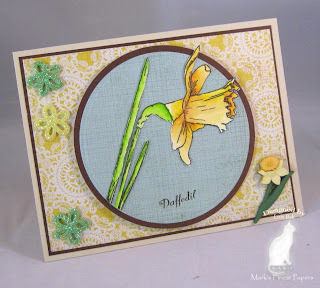 I stamped the daffodil from the soon-to-be-released set Daffodil and Anise from Mark’s Finest Papers Speedy the Cat collection onto watercolor paper. Using markers and a water brush, I colored in the flower and then cut it out. I didn’t want to add too much activity, so I just cut the plain circles using nestabilities and then glued the daffodil on top. The sparkly flowers and small daffodils are the required button embellishments. All cardstock, Palette ink, and Basic Grey DP available at Mark’s Finest Papers. The stamps will be available on March 10th. We all love our nesties, don't we? I'm no exception. I've got a pretty good assortment of them in my collection. 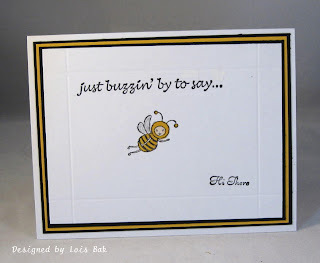 But today's Technique Challenge on Splitcoaststampers was to create a card using something other than nesties to arrive at the same look. I chose a Fiskars squeeze punch for the corners of my main panel layers. I stamped the bunny rabbit from the Spring and Easter 2010 set from Mark's Finest Papers: Speedy the Cat Collection onto the Snow Storm Smooth, and then layered it with spring colors -- Frosty Mint Sparkle, Lemon Slice, and Pink Freeze Sparkle. I had to tape a small piece of the mint cs behind the cut-out portion of the corner punch so that only the green would show through. The way the punch was situated left a small section of yellow showing, and I didn't want that. I colored the image with Copic and Prismacolor markers and then used some sparkly flock from Sparkle and Sprinkle to add some texture to the Easter bunny. The DP is from Basic Grey's Porcelain paper pad, matted with more of the Pink Freeze Sparkle. I added a little bit of ribbon and the cute little rabbit charm -- and I was finished. What I like about the Technique Challenge is that it gives you the opportunity to try something new. And today, it actually had you doing something old -- back before Nesties became such a big part of the stamping world. All materials (except flock) available at Mark's Finest Papers.